East Fife manager Darren Young says his side have nothing to fear when they face Ross County in the Irn-Bru Cup semi-final. The Fifers head to Dingwall for the televised clash this Friday night full of confidence after Saturday’s game against Partick Thistle. 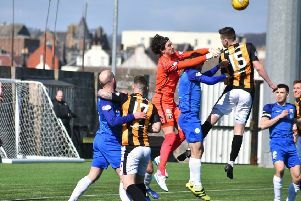 Despite losing the Scottish Cup clash 1-0 to the Championship’s bottom side, Young said that the performance means that his side are more than capable of causing the division’s leaders a few problems . “We did very well against Partick,” he said. “I’m delighted with the performance but disappointed with the result. “It would have been great to have been in the hat, even if we had played rubbish and got through. “It is what it is. We never took our chances when we were on top and they took theirs. Basically that’s it. “I felt we were the better team and had slightly better chances but when your playing against a Championship side you’ve got to take them when they come. “It wasn’t to be, but we can take a lot of positives from it. “We’re coming away from a game against a Championship team, we’re six games unbeaten now, and we’re disappointed that we haven’t won. Young praised the effort that his players have put in over the course of the season so far. “The boys are doing really well,” he said. “Week in, week out they’re working really hard in training. Now Young will turn his attention to the semi-final in Dingwall and says he is well aware how difficult a match it’s going to be. “Ross County are doing very well this season. “They’ve got strength from front to back, they’ve got a lot of attacking options. If you give them a chance, you know they’re probably going to take it. “They had a game on Monday night, though, so hopefully that’ll go against them! “We’ll be telling the boys to got out there and just play the way they’ve been playing. We’ve been playing with confidence. When we get the ball we like to try and pass it.